Just as young adults feel the pressure to belong by behaving in a certain way that isn't true to their natural personalities so adults can feel unnecessary pressure to buy stuff to belong. I know in the past that I've bought clothes to belong just because they were the latest fashion and not because I actually liked the garment. I've chased status and a bigger mortgage debt to belong in the belief that these were part and parcel of being a successful adult. If you're new to a minimalism there can be times when you feel socially awkward when those around you are talking about their recent purchases, holidays and lifestyles. You may feel like you don't belong and be tempted to withdraw from social gatherings altogether. Whoa! Living with less needn't cramp your style. It can be easy to think that you need to buy things to belong. But surely as human beings we all belong. 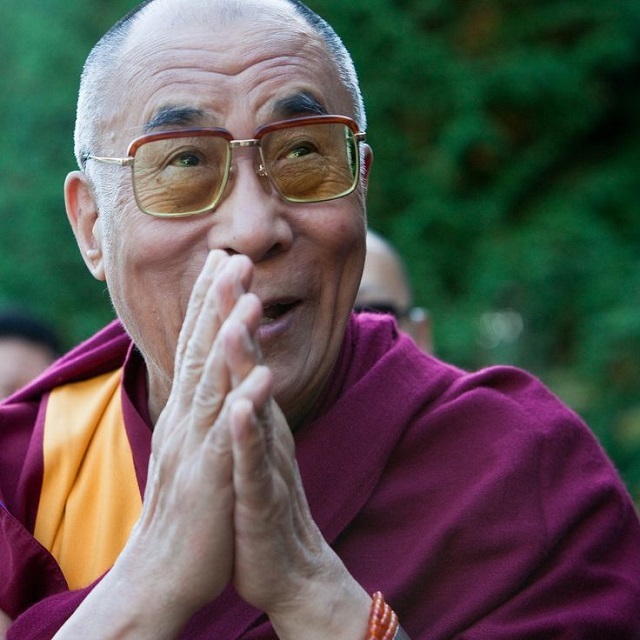 The Dalai Lama at Glastonbury Festival this weekend said that we're social beings. He demonstrated genuine social connection by appreciating the warm welcome and vitality of the festival goers and performers around him. This spirit of gratitude, generosity and acceptance is why he felt and looked so at home at Glastonbury. He was at peace with himself and with the complexity of the diverse situations of those around him. The Dalai Lama was welcomed for his open-heartedness, compassion and smile. Not for his material possessions. 1. Be confident in yourself and be honest to others about your lifestyle choices. Be yourself and smile. Don't feel under pressure to conform, consume or compare yourself to others. Be a proud ambassador for being happy with less. 2. Be happy for other people if they're happy. Express genuine pleasure in their happiness (even if it comes from material possessions). 3. Say no sometimes. If your friends are always planning expensive get togethers don't feel like you have to join in every time. Be the one to suggest cheaper alternatives for meeting up. 4. Steer the conversation away from consumerism if you can. 5. Don't judge people on first appearances. Find common ground. OK, you may live totally different lifestyles but we're all human and you may find you have more in common with someone if you keep an open mind and let the conversation flow. Maybe you have people, places and interests in common. Belonging isn't about us all being the same, having the same possessions or social status. We can connect on so many different levels. Money, possessions and status can irritatingly get in the way of this. Excellent post! I was at an event where the Dalai Lama spoke, he is wise and funny and I was so impressed with his humility. I do think living simply has a lot to do with confidence. I have learned the hard way that I am worth more than any possessions I may have, and the peace of mind that comes from being debt free, far outweighs the temporary pleasure of the latest fashion. I wish I had realised this years ago, when I was comparing myself to others and feeling I had to keep up. Thank you and yes it's been a gradual process for me too! What's interesting, as I make more steps to declutter my life and am upfront, I often hear others really want to simplify and minimalize too. I've gotten the blank stare too, but in reality, those come from people I don't necessarily want to fit in with and spend my time with anyway. Many people do this naturally. In fact it's quite normal not to be full of yourself and trying to push yourself forward with a false image. Most people don't spend money on stuff they neither want or need either. Preaching to tell people who don't act out this way is rather pushy behaviour. The Dalai Lama spends rather too much time spent with celebrities so I don't necessarily see him as a good example. I especially like the first one. I'm happy with my decision to minimize....until I visit w friends. I can't help but look at their possessions/collections & wonder what on earth they think when they visit me.